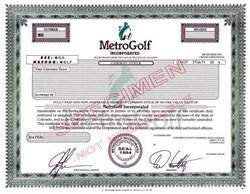 Beautifully engraved unissued certificate from the MetroGolf Incorporated. This historic document was printed by the Columbia Financial Printing Company and has an ornate border around it with a vignette of the company logo. MetroGolf Management, Inc. manages golf learning centers designed to provide a wide variety of practice and play opportunities in major metropolitan areas. MGMI first managed MetroGolf Illinois Center, the world�s first urban golf center of its kind, located in downtown Chicago. MetroGolf facilities are located in areas with a high concentration of office, urban residential and hotel development that are typically convenient for the time-constrained golfer. MetroGolf centers offer practice facilities, instructional programs such as the David Leadbetter Golf Academy, a full-line pro shop, restaurant, bar and catering facilities, group meeting and special events area, and when possible, a par-3 or executive length golf course. The urban golf center is a proven concept that can rapidly develop substantial operating cash flows. 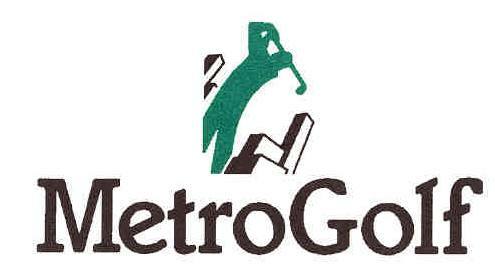 MetroGolf Illinois Center generated over $1.8 million gross revenues in its first 12 months of full operations. It is a simple idea -- an upscale convenience store concept applied to golf as a recreational amenity. Urban golf centers are high profile projects in major metropolitan areas. In its first year, MetroGolf Illinois Center was featured on the Today Show, CNN and 25 other local and syndicated television programs; was the subject of feature articles in Sports Illustrated and Chicago Golfer; and has appeared in over 180 publications including The Wall Street Journal and The New York Times.